The Midnight Legion is an interactive story where you choose how to respond to what happens next. Created for solo play, with a 2 player option, this three book game series promises hours of gaming. 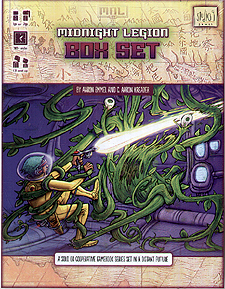 Starting with Book 1: Operation Deep Sleep, everything you need to begin is contained in this boxed set. You are an elite, android agent, clandestine group who was forced awake after hundreds of years of stasis. Your memory is gone, and you can't recall your purpose. You will need to solve puzzles and choose whether to use combat, stealth, or sixth sense and diplomacy to unlock your mission and the secrets of the world you knew. Whatever you decide, your actions change the world around you and determine the encounters you face - making each game different. But in every game you will need skill and cunning to uncover the mysteries of the Midnight Legion.